For Aqua Therapy or Any Day at the Pool! 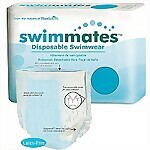 Discreet unisex disposable underwear is worn under your bathing suit. 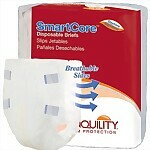 It features Kuftgaurds and moisture barrier to help contain bowel incontinence. 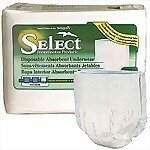 Designed for minimal swelling and does not break apart when wet. Available in 5 Sizes from 22" up to 80"
Holds up to 14.5 ounces of liquid! This pull-up style underwear by the makers of Tranquility provides the perfect combination of moderate to heavy incontinence protection at a great value. Holds up to 19 ounces of liquid! This pull-up style underwear by the makers of Tranquility provides the perfect combination of moderate to heavy incontinence protection at a great value. Features two embossed channels to direct fluid into the pad and elastics to form a cup shape. Unisex - Worn in regular underwear. 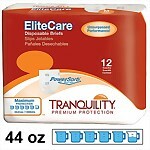 Tranquility's highest capacity disposable brief with ultra-thin PowerSorb® Micro-layer holds up to 44 oz. of liquid for the ultimate protection All Day- All Night! Available in 3 Sizes from 32" up to 64"
Maintains an ideal micro-climate for preserving skin integrity, while the high capacity absorbent peach core remains effective up to 6-8 hours for day or night protection. Available in 5 Sizes from 24" up to 80"